We had one day left on the island (excepting a travel day) so we decided to visit our friend Sandee and do some exploring. 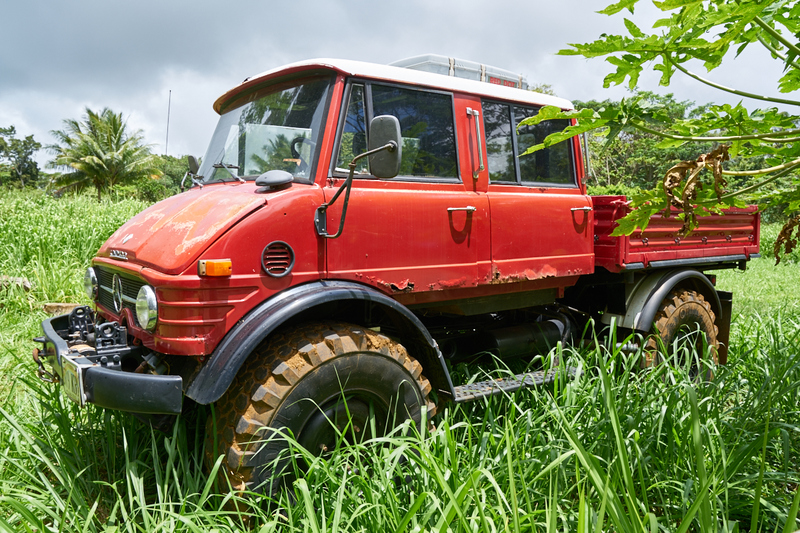 Kathleen determined that there was a Unimog on Kauai and she contacted the owner. We both realized years ago that "no trip is complete until you see a Unimog" so we hopped in the rental jeep and headed out. Typically, when we determine that a mog is in the area, we contact the owner and attempt to hook up. We have done this many times it the past and it always resulted in interesting encounters. We found the mog without any hassle. It is a garden-variety 416 DOKA with a new winch. The tires are standard Continental off-road lug. Other than that, it was a very generic truck (for Unimogs). 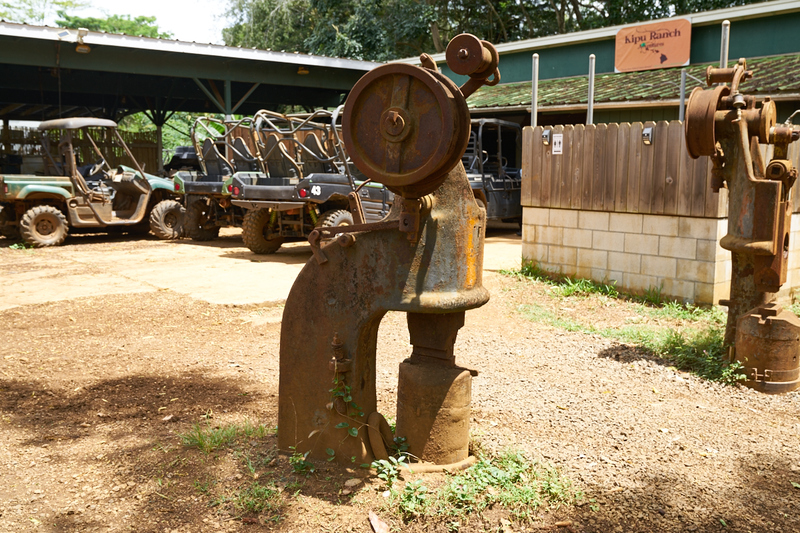 The guys at the Kipu Ranch that we talked to said that they used the truck in the rainy season and when one of the quads gets "really stuck". The door rust is not that uncommon for a middle-1970's truck. 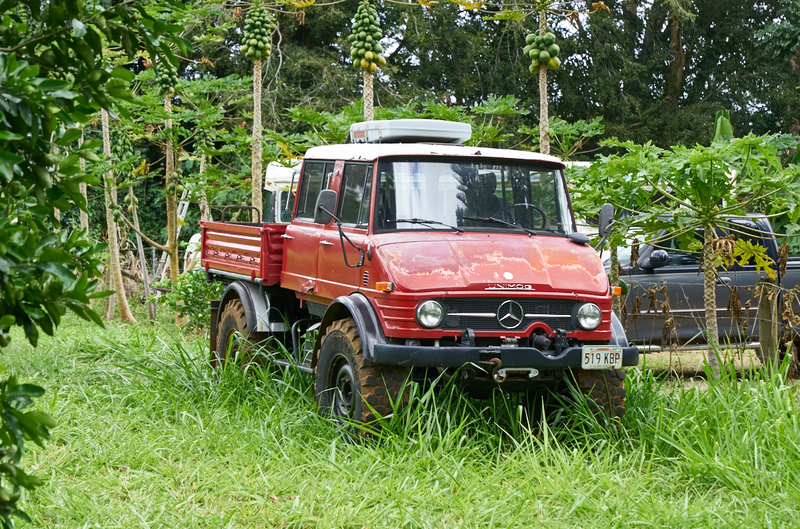 The Kipu Ranch does quad tours and they had perhaps 30 of them on site. The odd equipment in the foreground of the photo above is some kind of old, belt-driven forging machine. 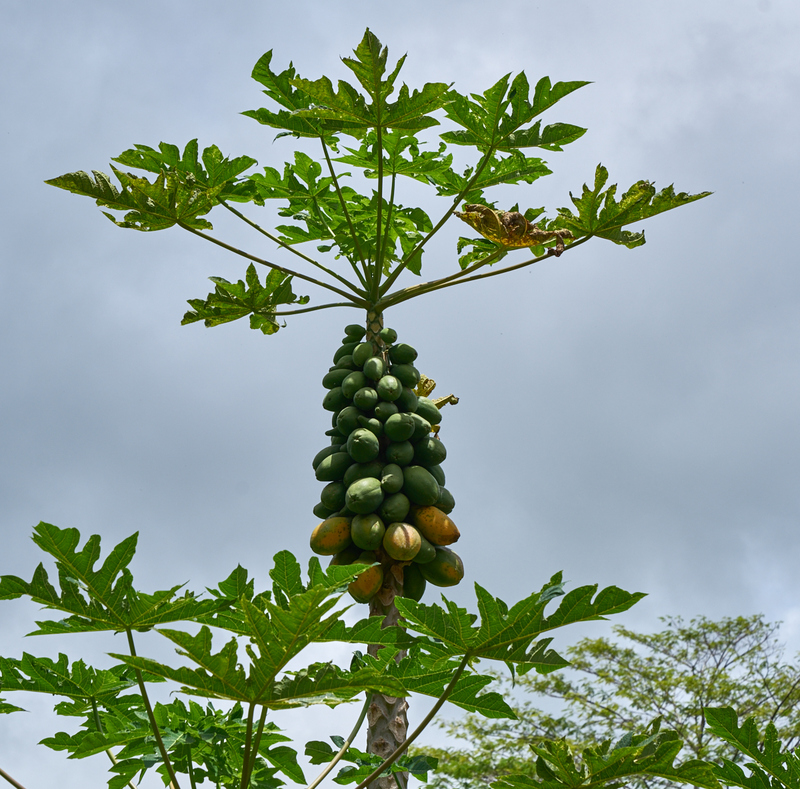 There were a bunch of papaya trees on the ranch. 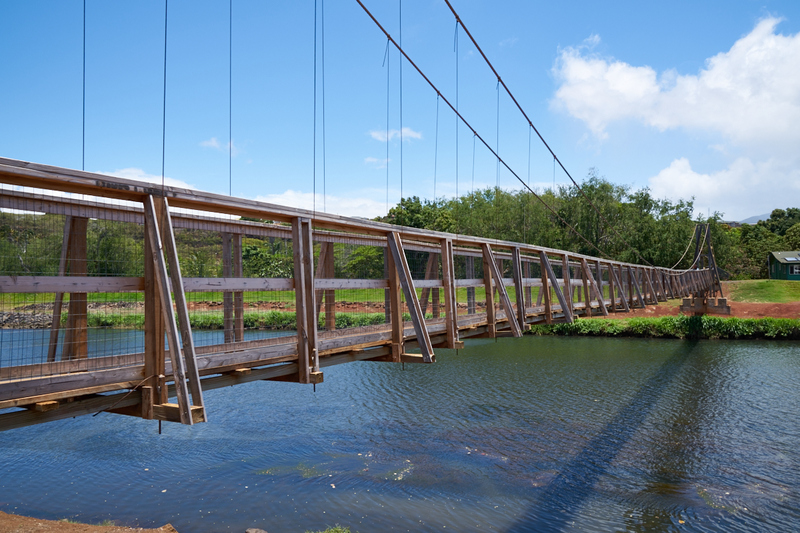 Since we were heading toward Lawaui and were "in the area" we decided to check out the hanging bridge at Hanapepe. This bridge was built in 1915 to allow crossing the river. 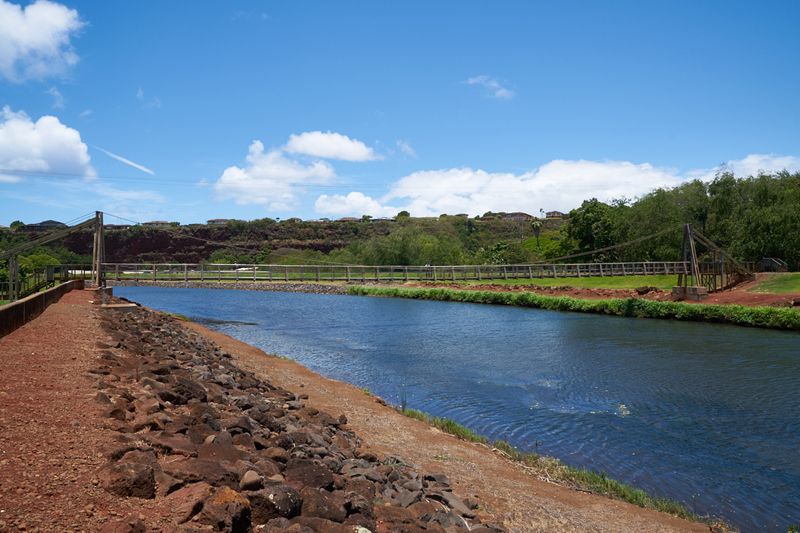 The bridge was damaged in hurricane Iniki and a big chunk of it was rebuilt as a result. 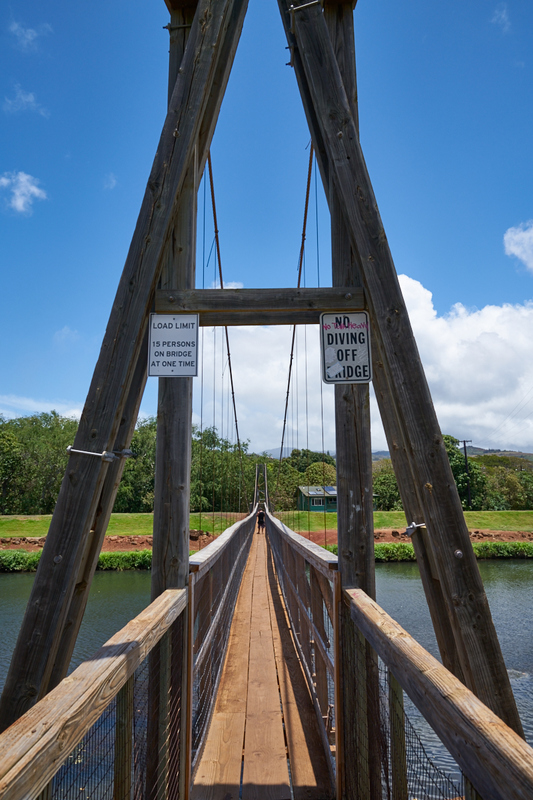 Most of the bridge is wood, so one has to wonder about termites. The bridge swings quite a bit when the wind is blowing. And it creaks when you walk on it, which is very creepy. We picked up Sandee and headed to Poipu for lunch. After eating, we walked along the seawall. Note the "pillow lava" rocks on the beach. From Poipu we headed to Shipwreck Beach. Kathleen wanted to see sea turtles, but the water was too rough. While there were no turtles, there were no "gringas gordas" either. Note the fellow on the rock point. The young and stupid jump off the rock into the ocean and he was there to take photos of the resulting carnage. 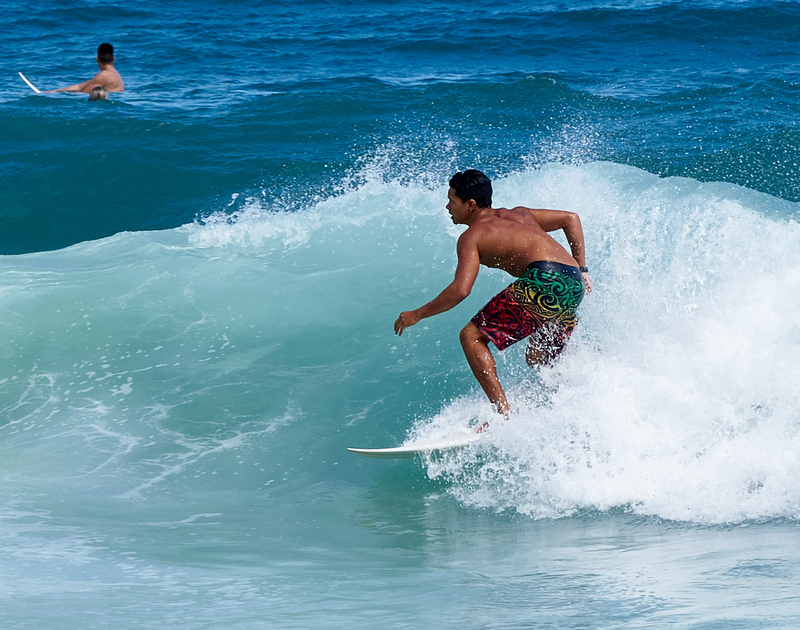 There were plenty of boogie boarders and surfers in the water. This fellow gets a pretty good ride. This young gal was a very good surfer. She caught wave after wave. The boogie boarders got good rides. This fellow was a very accomplished surfer. 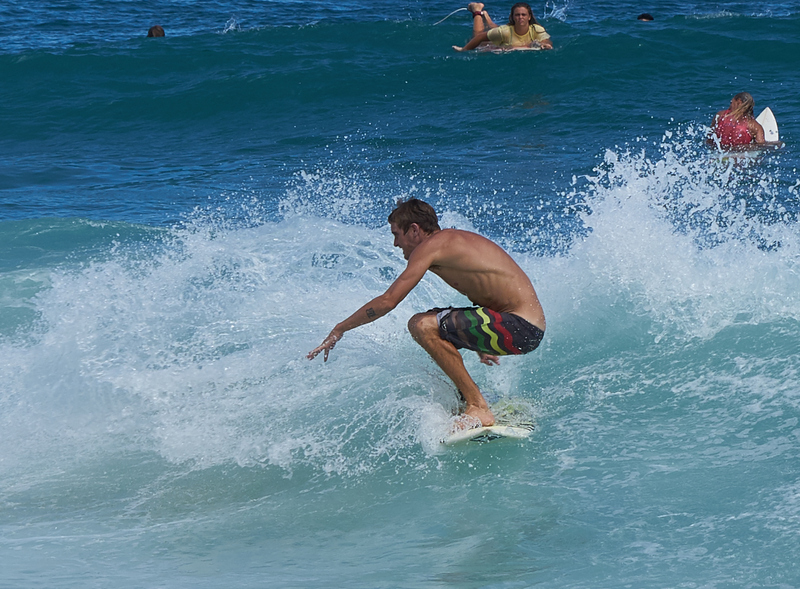 Above, he cuts a tight turn at the top of a wave. This fellow looks like he is working hard. A tight turn but an unhappy ending. Some of the surfers came pretty close to the cliffs. While pretty girls make great photo subjects, the real story is the fellow doing the 360 degree turn behind her. This gal caught wave after wave much to the chagrin of the male surfers. She cut hard when she got close to the beach to return back into the big waves. Note the leash trailing behind her board. These were pretty good-sized waves. She was back at it in short order. She looked distracted by I could not tell what she was looking at. She was still going strong but it was getting late and we had to roll on. 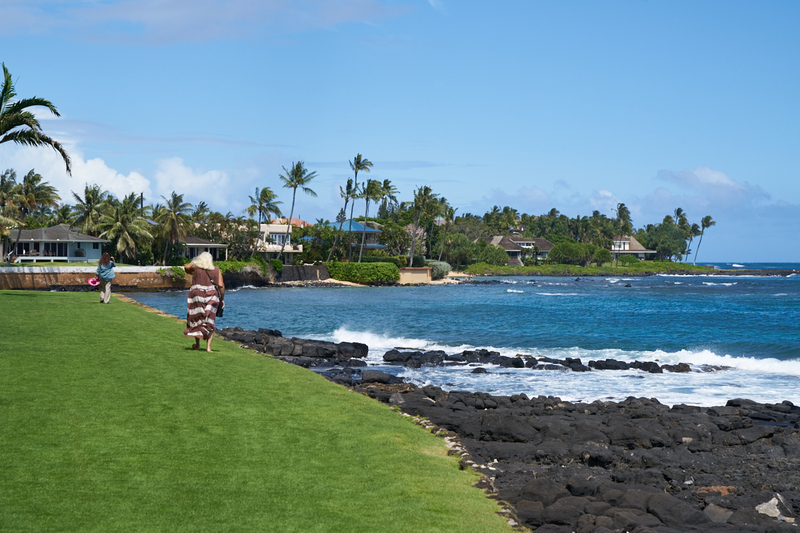 We took "sandy Sandee" back to her place in Lawai and we headed back to our hotel on Kauai Beach Resort. Tomorrow, we knuckle-down for the plane flight back to the mainland. It has been a great 2 weeks on the island. Photos and Text Copyright Bill Caid 2016 all rights reserved.